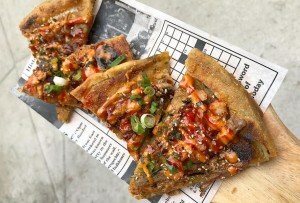 A Boston classic gets a new lease on life with a dramatic overhaul that might be a bit too ambitious for its own good. By Corby Kummer·	 12/23/2008, 11:38 a.m.
Of course I want to see the Marliave succeed. 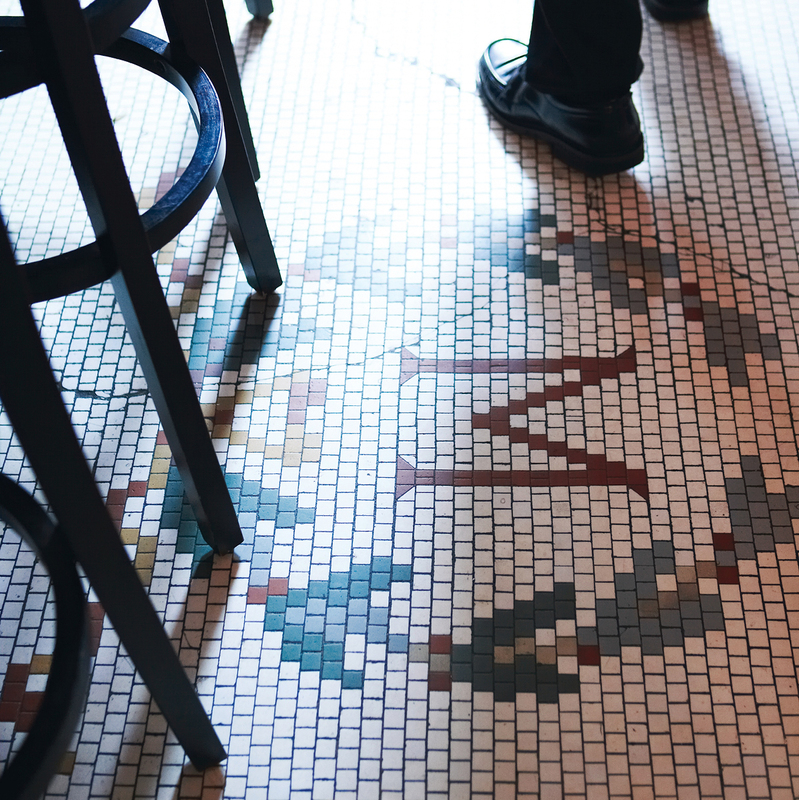 Who could wish anything but success for a historic Boston restaurant that opened in 1885 and sits right in the middle of Downtown Crossing, an area that badly needs locally owned businesses? 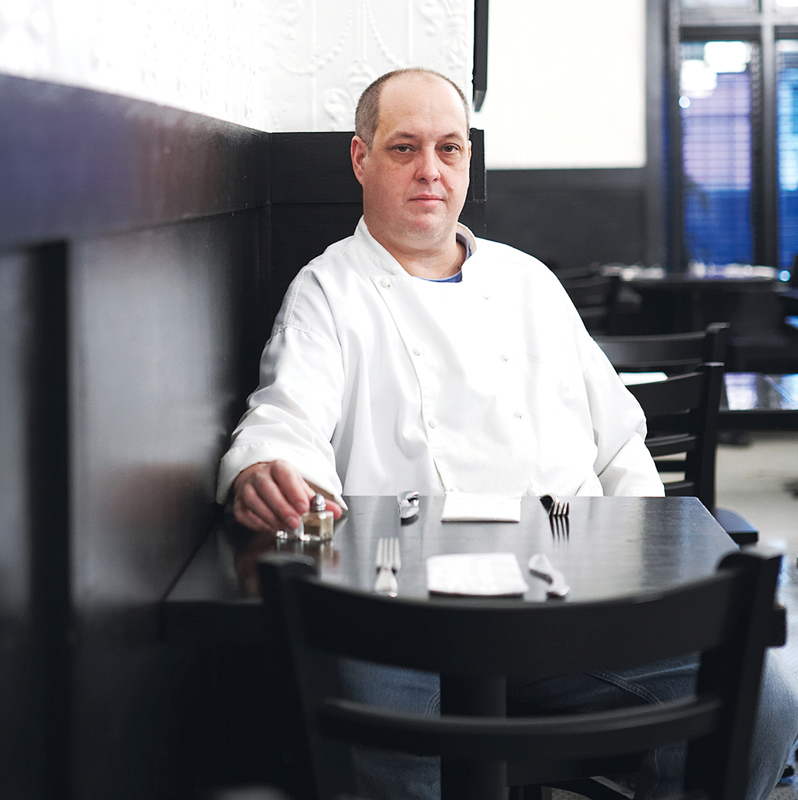 The challenge of reviving the long-shuttered landmark attracted Scott Herritt, a mostly self-trained chef who owns Grotto, a hidden gem of Beacon Hill that serves a fresher version of the North End Italian he learned while cooking at the Florentine Café. If he can make a semi-basement behind the capitol succeed, turning a big downtown bar and restaurant near City Hall into a hit isn’t too far-fetched. Herritt dug into the task with imagination and respect, transforming the downstairs bar into a photo-filled tribute to the Prohibition era. 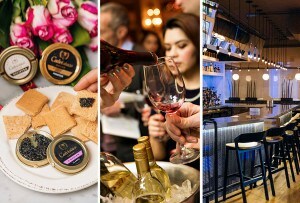 The black-and-white-tiled, brass-railed space seems constantly lively and filled with people enjoying carefully made cocktails and a wide choice of simple bar food. 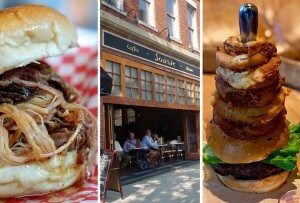 (The full menu is also offered downstairs.) 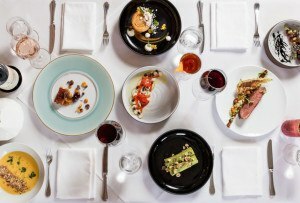 The upstairs is the fine-dining experience, and it represents Herritt’s aspiration to compete on the high-price, high-stakes level of Boston’s top dining destinations, with the kind of continental polish that the Marliave embodied in its beginnings as a French restaurant. As it happened, the dining room underwent a substantial change soon after it opened—not usually a positive sign. 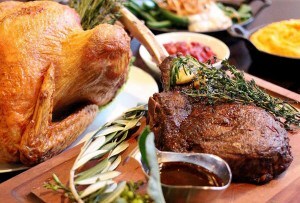 But it was a good change: from a confusing menu whose main courses were all split into two (making a meal with an appetizer and dessert four courses, not three) to a more familiar, better-timed setup. The next change should be a similar streamlining of the prices, along with some of the chef’s grander ambitions. Herritt obviously can cook, and he clearly cares about buying top-quality, local ingredients and preserving their integrity. However, in undertaking a complicated menu—most entrées have at least three components—he can’t seem to maintain consistency in seasoning or preparation. There’s inconsistency in the cost-to-quality ratio, too. The starters are reasonably priced for the portions they offer: between $13 and $17, with an outlier at $30, a caviar-laced egg dish that happens to be the best one. But the main courses are way too expensive at $29 to $44. And too many are not just underseasoned but also unsatisfying, with underflavored meat and underimaginative vegetables. Yet there’s hope. 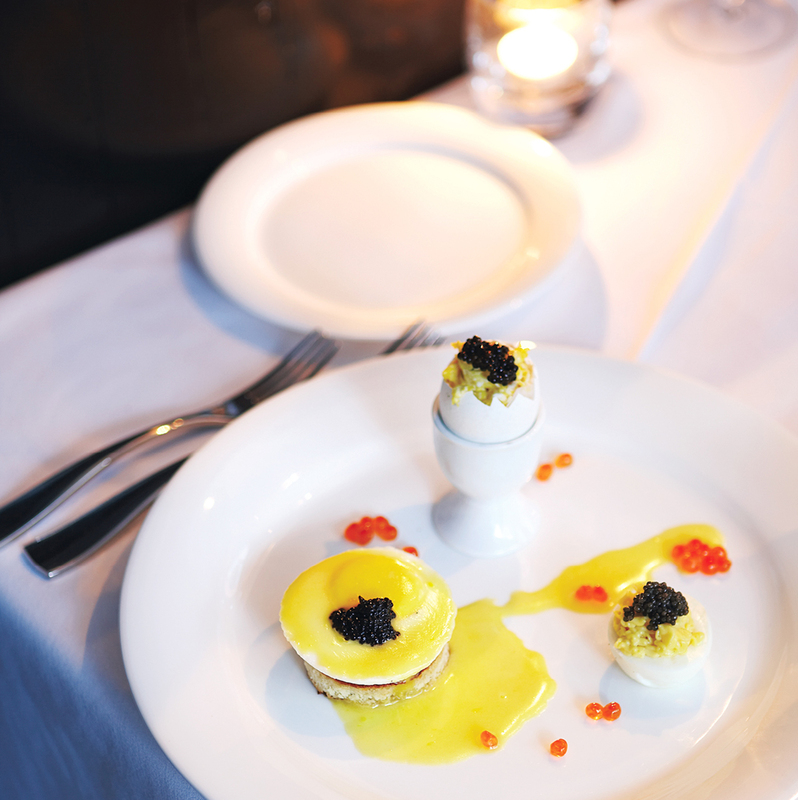 Herritt has a refreshing restraint that comes out in, for instance, that egg appetizer, served as a trio with a lovely poached egg on toast beneath a thinner-than-usual hollandaise, a bland but fine deviled egg, and soft–scrambled eggs with three kinds of caviar. Though the eggs were cool by the time they arrived, all had a beautiful and just-right texture that’s not easy to achieve. Herritt’s reimagined clam chowder ($14), already a signature dish, is a shallow pool of simple reduced-cream broth base below hand-cut carrots and potatoes, big squares of braised Vermont pork belly, and a few meaty littlenecks steamed to order. It was so good I wished for more of the broth, and it’s an example of where Herritt, reaching for elegance, succeeds. Entrées could all use editing. The best so far are sweet Nantucket Bay scallops poached in an artichoke and leek broth, alongside seared diver scallops with slightly salty uni butter ($34)—as with the egg appetizer and the chowder, the flavor of the principal ingredient comes first. 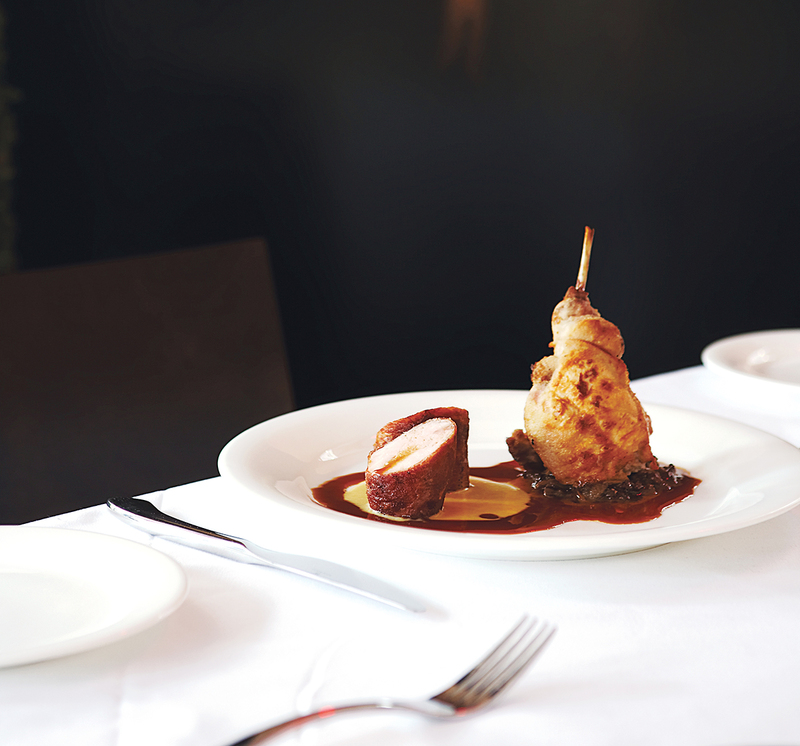 A black truffle–stuffed leg of rabbit beside a prosciutto-wrapped loin ($34) is a bit precious, with the leg placed vertically like a cancan dancer’s, but has nicely flavored if slightly underdone meat. No other main I tried warranted the price. Wolf Neck Farms tenderloin and braised short rib with sauce Diane ($42) and rack and braised shoulder of lamb ($42) are tender but so mild in flavor you can hardly tell them apart. Veal chop Milanese ($44) has too much breading and too little flavor, as does the overly rich risotto beside it, but at least the plate has some green asparagus, topped with a poached egg. The potpie ($29) keeps to local and in-season (unlike the asparagus) vegetables, including Macomber turnips and parsnips, but is almost completely unseasoned, with an underbaked round of puff pastry and not-very-truffley black truffle butter. Have you noticed a white theme? (I know you’ve noticed the prices, unsustainable in this economy.) Aside from an arresting beet starter ($13), with borscht and a napoleon of thin-sliced beets and goat cheese, and salad with greens and heirloom tomatoes ($14) from Eva’s Garden in Dartmouth, nearly everything is white or light brown. Even the (three-part) desserts are monochromatic. The chocolate option ($10) has the most color, even if it’s brown, with a particularly good flourless cake made with superior Callebaut baking chocolate. The vanilla-themed plate ($10) comes with a curdy crème brûlée, tiramisu parfait, and dull vanilla cupcake with mascarpone frosting. The trio of house-made ice creams in vanilla, ginger, mint, or lavender ($9) is well executed, but picture it: three little white scoops in three little white cups on a big white plate. If Herritt can keep the restraint, double the color, and roughly halve the prices, he’ll keep the upstairs dining room as lively and happy as the downstairs—and give a grand old landmark the new life it deserves. The Marliave, 10 Bosworth St. Boston, 617-422-0004 marliave.com.